UTA now 16-10, 10-5 on the season, while San Jose State drops to 9-17, 3-12 in a game in which the shot clock was rarely a factor. A lot of fun to watch. In a game reminiscent of most recent fast-paced UTA-Texas State contests, this was a classic case of one team shooting a lot of 3s and hoping they can make a lot of them, the other team running a balanced offensive attack. And for the first half, it nearly worked for SJSU. SJSU was an impressive 5-9 from 3 the first half, but a cooler 5-16 the second half for 40% for the game. The game was pretty even for the first 17:00 or so until UTA went on a nice run to make it 39-30 at halftime. Teams are rarely hot from outside for two halves, and SJSU finally cooled off in the second half. 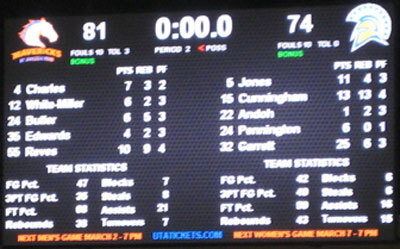 While San Jose outscored UTA by 2 (44 to 42) in the second half, the game wasn’t as close as the final score indicated. Using little of the shot clock, San Jose took a lot of 3s (totally in the flow of their offense–they were fairly good looks it seemed), but in basketball missed 3s often lead to long rebounds for the other team and fast breaks (18 fast break points vs. 2 for SJSU) and some nice dunks for the UTA. I think UTA even had a 4-on-1 fast break at one point. But turnovers also lead to fast breaks and some nice dunks, which was probably the difference in the game–UTA took good care of the ball tonight (just 7 turnovers vs. 15 for SJSU) which resulted in 22 UTA points off turnovers vs. just 5 for SJSU. Jamel Outler had another nice game for UTA–15 points in 14 minutes (5-9 shooting, 3-6 from outside, 2-4FT). If he can stay hot and the offense shows continued improvement after a couple of tough games early in conference play…UTA could be a very tough team to beat in the upcoming WAC tournament. Next up: Utah State saturday night. This entry was posted in Basketball, College Park Center, Dunks, Mavericks, Uncategorized, UT Arlington, UTA, WAC, Win and tagged College Park Center, mavericks, WAC, win by rustyhancock. Bookmark the permalink.